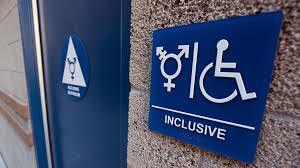 The Newest Rant: Bathroom Rights/People Just Want to Pee! I'm done saying logical responses to all the people who want to claim transgender people pose an inherent risk to others in the bathroom. A transgender person is more likely to be assaulted by someone than the other way around, by your logic the men you are worried about following little girls into the bathroom pose a risk to your sons--which you never seemed to whine about, etc. etc.. All your supposed statements and points just hide ignorance, and I'm done trying to use common sense. I'm just going to call you a bigot and refuse to engage with you, because you're on the wrong side of history, not being inclusive, and otherwise being a jerk. Transgender members of society and people who support them aren't going to quiet down. Sorry you can't get away with persecuting people as much now as in the old days. I'm done talking about this supposed controversy that is just an excuse for people to be hateful. I don't plan to address the right of a transgender person to the use the restroom again. I'm done talking about it on Facebook, tired of tweeting at assholes about how they are assholes, and otherwise am happy to just let them live in their little bubbles of hate while we all enjoy life. Plus, it just means more good deals at Target for the rest of us. That's what I have to say about bathroom rights, and the last time I hope I need to address it. People just want to pee, can we please let them?